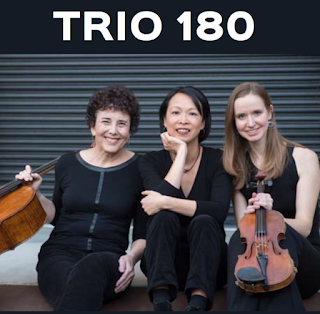 Trio 180, the faculty piano trio-in-residence at the University of the Pacific’s Conservatory of Music, is dedicated to its roles as performer, proponent of new music, and educator. In addition to giving concerts and master classes throughout the United States, the trio has been featured on concert series in Mexico and Canada. Trio 180 is thrilled that their first CD has come out, featuring works by Dvorak, Suk and Schumann which received a wonderful review in Strings Magazine. Trio 180 will perform Dvorak f minor trio, op. 65 and assorted pieces by Astor Piazzolla.